We compare three of the top GPS bug trackers on the market and see which comes out on top. Find out the best budget buy and also which is the most effective device in today's guide. Ever had that feeling you’re being watched? Or even being tracked and listened in on? Many of us experience this confusing but often correct instinct on a daily basis. You might be sitting on a busy train or in a café with a sudden urge to look over your shoulder and there they are. A pair of eyes fixated on you which quickly flicker away in embarrassment of being caught. There are a few hypotheses for this unusual but amazing ability of ours, but we won't delve into the murky and confusing depths of that hole right now. The problem nowadays is that it isn't just a pair of eyes that are secretly keeping tabs on us – people are doing it in other more secretive ways. So, What Does This Mean When Choosing A GPS Tracker Detector? We’re talking about the likes of GPS bug trackers that are fitted to our belongings and even added to our vehicles – as well as spy cameras, voice recorders, telephone interceptors and more clever devices that may be on other people or left in hotel rooms, restrooms, boardrooms, offices, our home and even in locker rooms. Most of these devices are actually used illegally. Before we start panicking and think a group of criminals or the F.B.I are tracking your movements, it’s more likely that other members of the public could be trying to watch you or eavesdrop on conversations. This is most common with those that have jealous or suspecting partners attempting to see if ‘he’ or ‘she’ really is just a friend, or business people trying to get sensitive information to hijack deals. Or again, it could be the F.B.I? We should also probably mention that they can be used defensively as well by the likes of schools and universities who want to make sure no students are cheating during exams. They do this by identifying smartphone signals that may be up sleeves, trying to communicate with other students or browsing Google. If people are telling you that you’re being paranoid and you just want to make sure they're right - or if you’re convinced someone is tracking your location, actions or your conversations, it may be time to use proven methods to find the bugs that our human capabilities are not yet able to detect. To do this, you’ll need a car tracker detector. To help you find one that matches your needs and budget, we have three quality options below. Read on to discover their features, capabilities and even where we feel they fall short. See how the best GPS bug detectors compare in the table below. Now it's time to take a closer look at our top 3 recommendations. Find out why we think these devices are worth a close look, and what it is that makes them stand out in a crowded marketplace. First under our microscope is the Spy Hawk Pro-10G. This GPS scanner features an exceptional design and has a lot to get excited about. For a start, it’s multifunctional and will detect a lot more than just GPS trackers. It will also notify you if a spy camera, telephone transmitter, or similar wireless devices are in your radius and compromising your privacy or security. It'll comfortably detect all types of concealed transmitters and even phone bugs. It's a multifunctional counter-surveillance tool that's effective in its primary role of detecting GPS signals and trackers, but does a whole lot more besides. 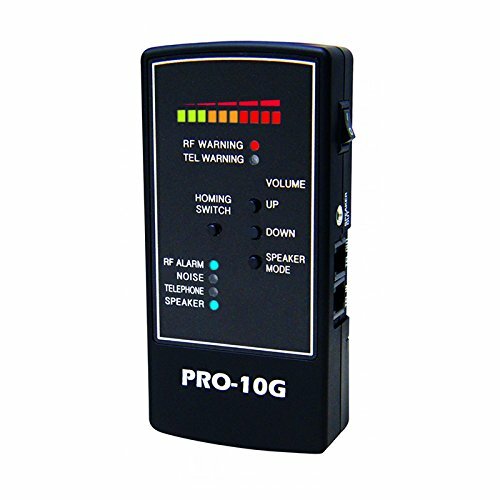 The Pro-10G detects signal interferences between a range of 10MHz and 10GHz – this is well above the industry’s standard capabilities for these products. It makes it perfectly suited to picking up the transmissions of even the most modern surveillance equipment. It also offers users the option of a white noise defense to help counter any eavesdropping device trying to get hold of your sensitive information – or just your jealous lover trying to find out what's actually going on with the secretary or work colleague. In the box you get a headset, 9V battery, and a telephone line adapter. The headset isn't one we'd choose to use though, and I'd go with my personal headphones which are of better quality. They're also not very discrete and if discretion is a concern of yours then you'll definitely be looking to replace them. Did we mention the lifetime user support? The Final Verdict: If you need an excellent bug detector for GPS trackers but also to find multiple other threats, this could be the perfect balance between value for money, features and capabilities. The second GPS detector we will review here is the Spy Matrix Law Grade. This particular model is an upgrade from some of the company’s previous work. Like the previously discussed Spy Hawk model, it's a multifunctional bug detection unit too. What we mean here is the device will be able to locate many different devices giving off wireless activity, including Bluetooth signals, WiFi and phone network signals. Common finds include GPS trackers that are stuck behind car wheels and in dashboards, phone line interception devices, spy cameras that may be used in sensitive areas such as hotel rooms and restrooms – as well as other similar bugs. Many products on the market just detect these interferences and privacy compromising tools. However, this tracker/detector is capable of providing some element of defense as well. In case there are any listening devices in proximity trying to eavesdrop on your conversation, the device will emit white noise so those people are unable to adequately hear your private conversations and access sensitive information. The white noise coming from the device is between a 40-50db range which means it’s effective at reducing audio quality. This is especially useful to business people or even high-level sporting teams who want to conceal tactics or team information. The device will track down interfering signals in an impressive range. The industry standard is to find hidden bugs around 6GHz, but this product will locate frequencies in a range between 10MHz and 10GHz. The product comes complete with a pair of earphones and a sensitivity control panel so you can locate bugs much more efficiently. It even has a display with intensity bars so you can detect the proximity of the spying device you need to find. 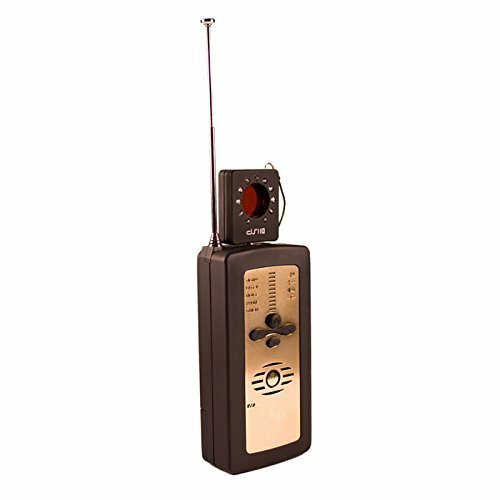 This GPS sweeper is relatively simple to use and can be operated with just one hand; it has a retro-style design and is light and compact enough to slip into a jacket pocket. To top it off, it comes with lifetime support! This device is similar to the Spy Hawk Pro-10G in many ways. It has a lot of similar features and an identically impressive frequency range. However, the accessories with this one are much more discreet. It's also significantly more expensive. It really depends what you're looking for, and as with most things you pay for quality. The Final Verdict: This is a fantastic GPS signal detector for people who will use it frequently or need a quality device. It's got a huge range of frequency detection but is also the most model expensive on this list. The final GPS detector is another phenomenal option for those of you wanting to get to the bottom of some unusual activity or just put to rest a gut feeling that you’re being tracked or watched. This is definitely one of the more discreet designs. It's completely black and looks just like a walkie-talkie. No in-person onlookers, or from behind a secret camera, will be able to tell what you’re doing in time to switch their devices off and remain undetected. The product will detect secretive and security-compromising devices by looking for radio signals such as electromagnetic radiation. These sorts of signals come from household appliances that can be harmful, such as refrigerators and computers. It will also detect cameras, Bluetooth and wireless signals, GPS trackers monitoring your car’s activity and similar FBI-like devices. It’s outstandingly simple to use this tracking device detector. All you need to do is switch it on and use the sensitivity knob to adjust it to your needs. When a potential threat is detected it will let you know using a loud signal and a light. Ten different levels of proximity and a color-coded display allow you to decipher how close the bug is. The product doesn’t come with a set of headphones or earphones like the others. This means public use is mostly restricted unless you want to walk around making loud beeping noises like a ghost hunter or treasure seeker. The GPS detection device also doesn’t emit any white noise like the previous two models and has a reduced range up to 8000MHz. If we compare this device to the previous two, there is a much wider gap of difference. The range on this one does not stretch as far as the others and it doesn’t have any headphones or alike to locate the bug without setting off noisy alarms that can be overheard. The Final Verdict: This one is really good value for money and makes these types of devices much more affordable. Be warned though, it's not as refined as the others. Recommended Article: Don't miss our guide to the top GPS trackers for cars next! Now we’ve looked at three quality GPS detectors for cars with multiple other detecting capabilities, it’s time to consider which one is the option for you. To help you decide, we’re going to let you know which product is what we believe the best overall and the one we think is the best value for your hard-earned cash. We believe the Spy Hawk Pro-10G is the best option on our shortlist, making it the best GPS scanner on the current market. We made this decision because it has an above industry-standard range; it can detect an array of security-compromising devices planted by devious business folk and soon-to-be ex-partners and it can offer an effective white noise defense against eavesdropping devices, such as planted microphones trying to steal sensitive or personal information. But, so did the second one!? It was a close call but there’s a reason we chose this one over the second product. We chose this one as the best GPS detector as it's much better value for money. It comes in at around 30% cheaper than the similar Spy Matrix model. In terms of the bug detection device which is the best value for money, it was a toss-up. There is an argument that both the Spy Hawk and the Dooreemee models are the best buys - but for different types of people. These two GPS sweepers have significantly different ranges and they also have slightly different functions and capabilities. For pure value for money, the Dooreemee model is extremely well priced. However, if you need something more effective and refined then it's the Spy Hawk Pro-10G all the way. Recommended Article: Need a new RF bug detector? Don't miss our latest guide. Now you know some quality options currently on the market, it’s time to help you decide which one you should do some more research on and maybe drop in your digital basket. To help you out, we’re going to explain a few things about these devices and pick on some terminology, so you don’t get bogged down in confusing jargon and make newbie mistakes. Many customers have become frustrated after purchasing similar items because they buy them thinking they will be able to shut down threats. In a way, these products do shut them down but require your input to do so. They detect various types of tracking bugs and try to help you locate them via signal strength displays and color-coded systems. It’s your job to then find them and dispose of or destroy them. Unlike what some previous customers believe, these devices don’t detect them and go on to block them instantly – that last bit is your job. It could be argued that some of them do go beyond detecting devices because some of them produce white noise. This is a solid argument, but this is more of a counter method than a way of interception what the planted microphone or telephone interceptor is doing. Not all of these devices have this feature. It is the reason why we wanted to show you two of the quality options above that do have this capability. We know our readership are a smart bunch, but we can all be forgetful and do stupid things sometimes. How long was the toaster not plugged in for before we started cursing again? One of the biggest mistakes that newbies make when using these products is that they forget to switch their own devices off before going on the search for bugs. You don’t want to be the person who was walking around their car or hotel room for hours to suddenly realize the bug that drove them crazy was a small black mirror in their pocket. The same goes for wireless routers and similar signal-emitting devices – turn them off or put them in flight mode before you start! 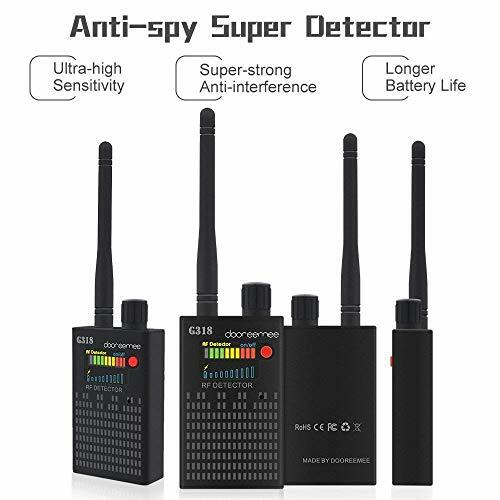 These products claim to detect products at different frequency ranges. It’s one of the most important functions of these devices and one of the things that should be a big consideration before you make your GPS bug detector choice. Therefore, it’s important to know a little about how wireless frequencies are detected and how they are measured. Megahertz are the units that are used to measure the speed of transmission in electronic devices. The term is often shortened to MHz. If you’ve ever bought electronics, you’ve probably heard of this measurement before and probably ignored it along with other jargon terminology in product specifications and instruction packs. When buying these products, it shouldn’t be ignored. MHz is the equivalent of one-million transmission cycles each second. However, there is another measurement known as GHz. GHz is much stronger than MHz and is used to state one-billion transmission cycles per a second. Electronics can change their production of transmission cycles each second depending on what they are being used for. It’s rare for a device to operate with the same frequency at all times when they are used for different things. Think of your smartphone when you surf the web – downloading a video and searching for a definition on Google doesn’t use the same amount of your overpriced data, does it? This means you want a tracker detector with a wide frequency range that can locate devices operating at low MHz levels, but can simultaneously detect more active bugs with larger frequencies. This is why the tracker scanners have a wide range to not let any device go undetected. Thanks for reading our awesome buyer guide where we have looked at some unique products that not everyone will be aware of. Next time you think something suspicious might be going on, don’t let it pass and get a GPS detection device to secure your, car, office or home instead!